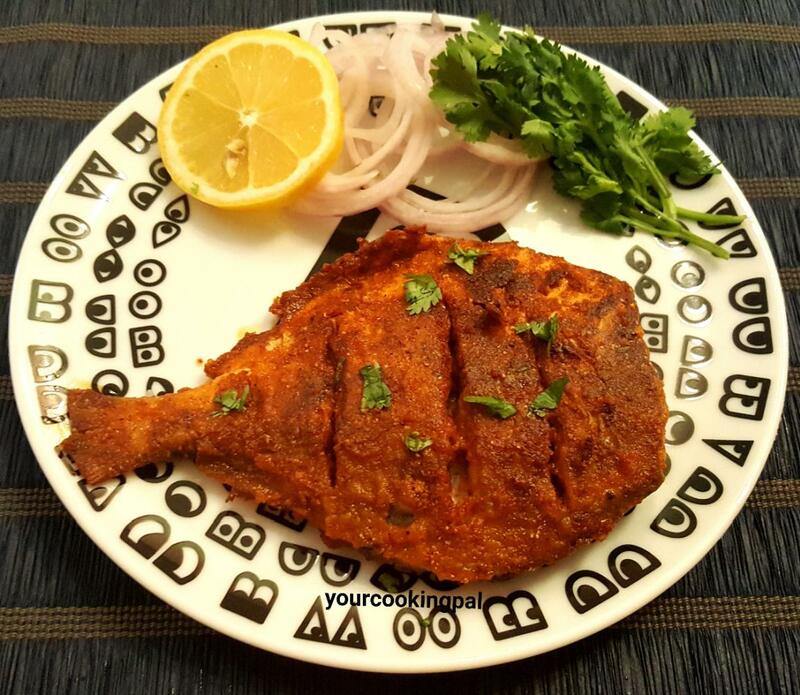 Pomfret fry is yummy shallow fried pomfret that are marinated with spices and then coated with Rice flour and Semolina and then shallow fried. This particular version is the Malwani style ( Coastal Konkan side) preparation of fried fish. Soak the kokum pieces into luke warm water for 5 mins. In the mean time wash, cut and prepare the fish for marination. 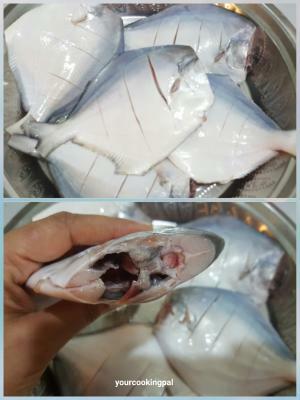 While cutting the fish trim the fins and the tail and cut the head portion clean out the inner part of the fish. Make slits on the pomfret. Marinate the Pomfret with salt, turmeric powder and Kokum extract for 5- 10 minutes . Now add the Malwani Masala / (Deggi mirch powder + Garam Masala ) and marinate the fish atleast 1/2 an hour before frying. 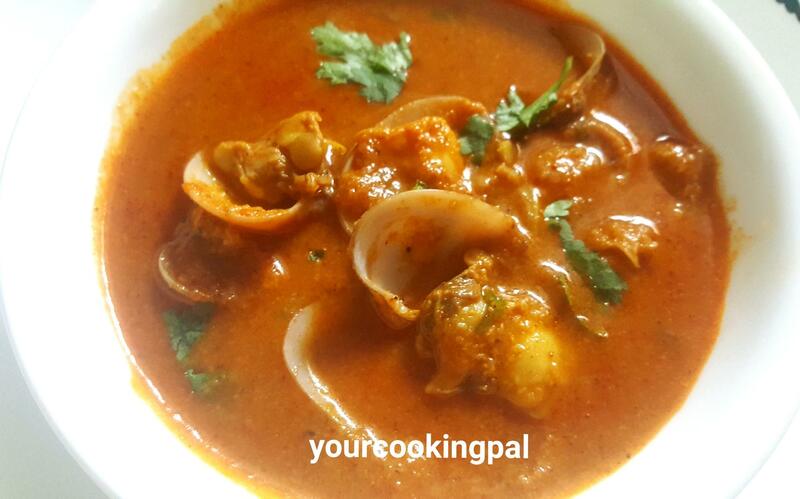 To make the coating mix Rice flour, rava ( semolina), Malvani Masala and salt in a plate. Coat the marinated pomfret with the coating. I used small to medium sized whole, however you can use whatever size is available. The procedure remains the same. You may also use small pieces of fish. 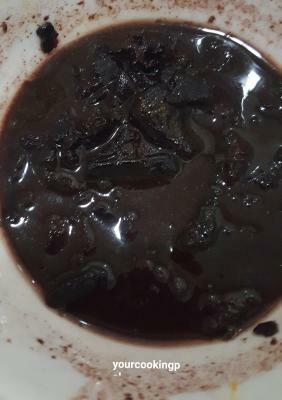 For the kokum juice/extract you may soak few kokums in very little lukewarm water. Alternatively you can also make use of ready made kokum extract. 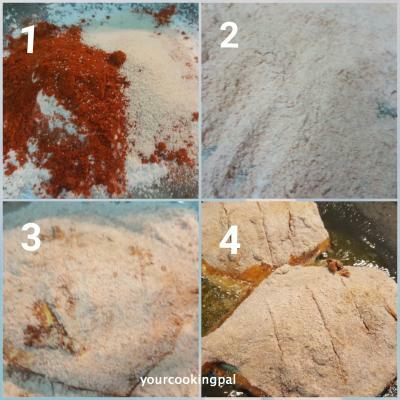 Malwani Masala used for this fish preparation is a blend of 2-3 varieties of dried red chillies and whole Garam Masala which is fried and then powdered. Malawani Masala is easily available in any store that sells Spices and Masala. 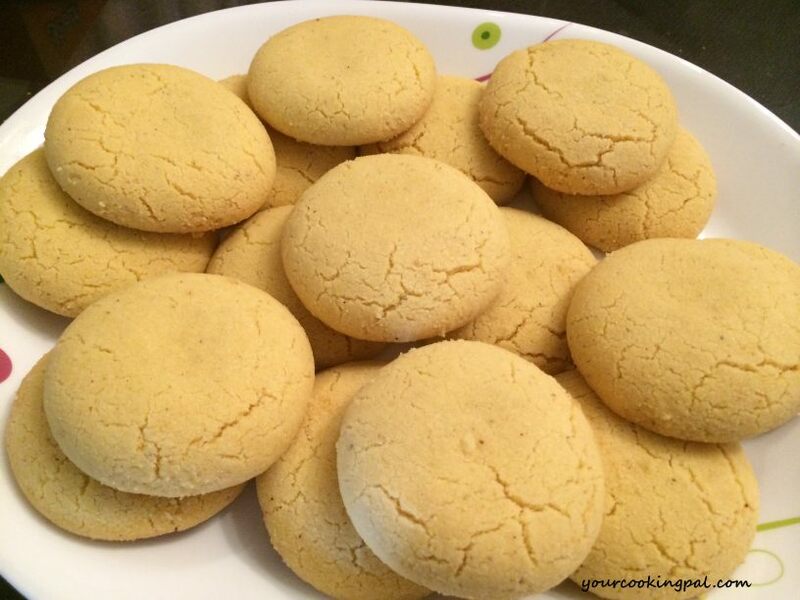 Alternatively you may use a combo of Deggi Mirch Powder along with powdered Garam Masala. 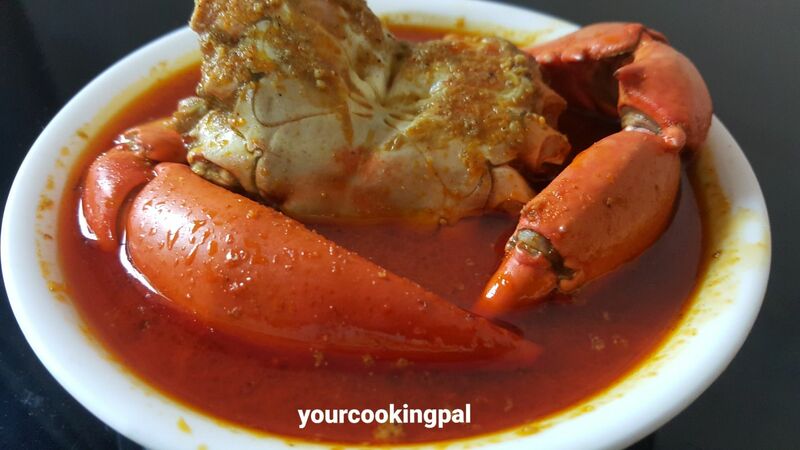 Dear Ma’am, I am a follower of Maharashtra cooking and I came across your blog… Just visited your blog and was blown away with your yummy recipes. 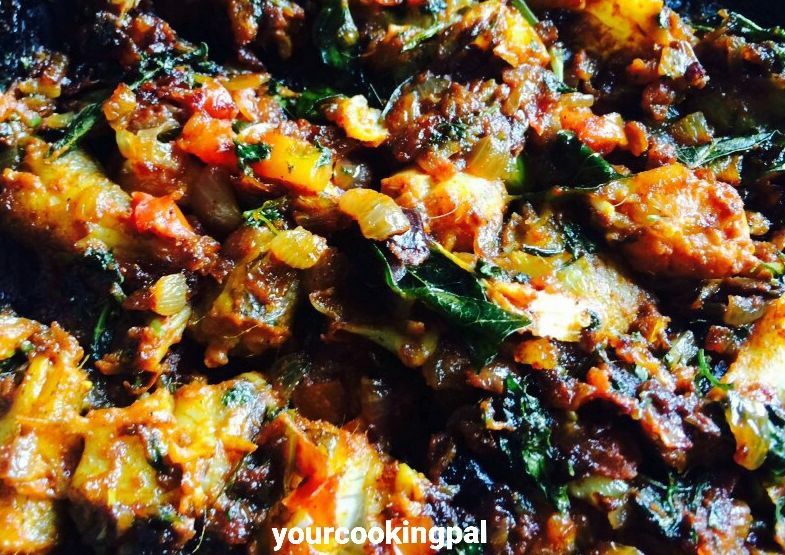 Do you by any chance send your recipes via email, if so, kindly add my email id….